Last weekend was filled with events, family, and of course stress. 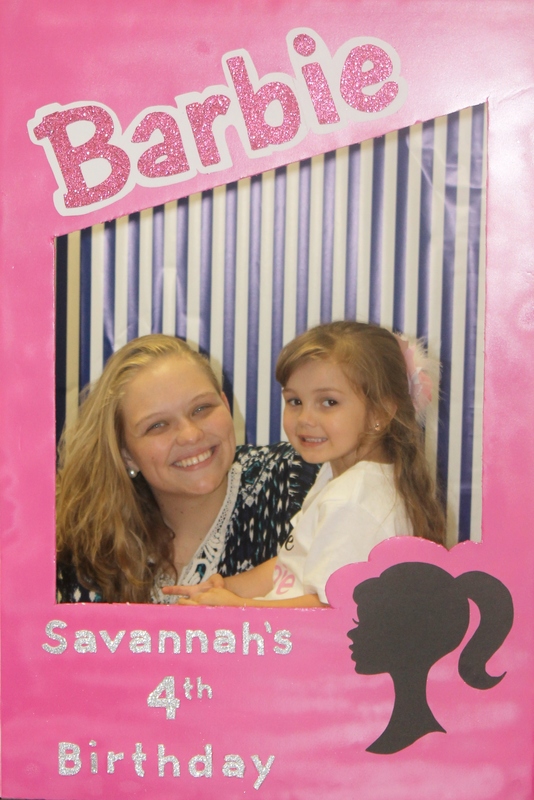 However, Savannah Rose had a wonderful party and it made everything so much better! Oh it has been a hectic, crazy, interesting, wonderful last two weeks. I am sorry I haven’t posted in awhile….but with everything going on I was all over the place. 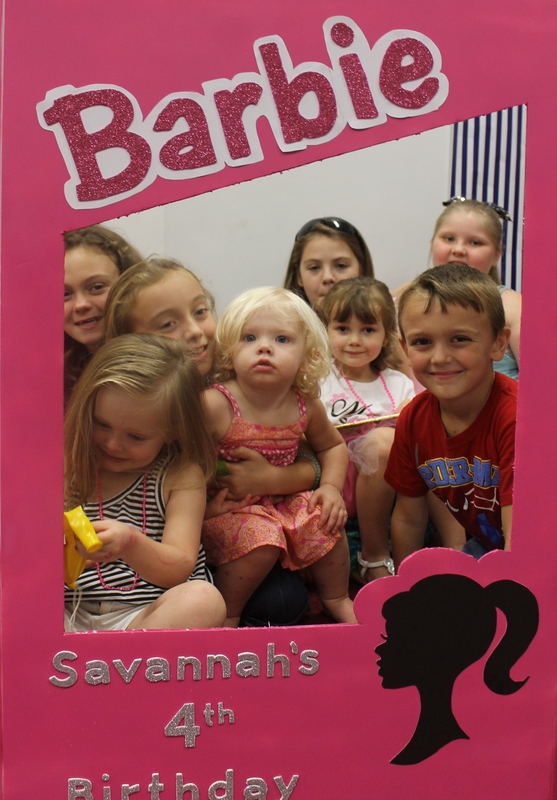 Most children only like certain toys or things…..not Savannah. She loves all toys and receiving gifts. You can get her the smallest toy and she will love it. 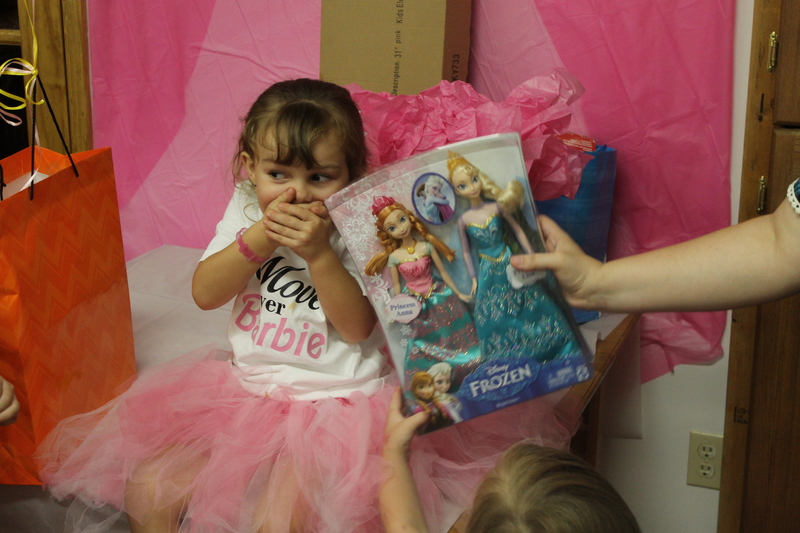 So I knew at her party she would love whatever gifts she got. She is a very grateful child (for the most part). 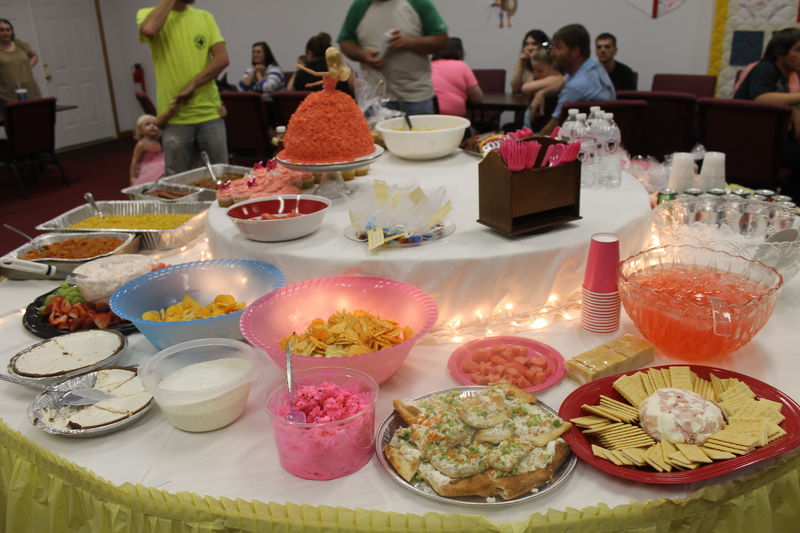 When planning the kid’s birthday parties I go ALL out! I start planning the parties months and months ahead of time. I allow the kids to pick their theme and I go crazy with it. 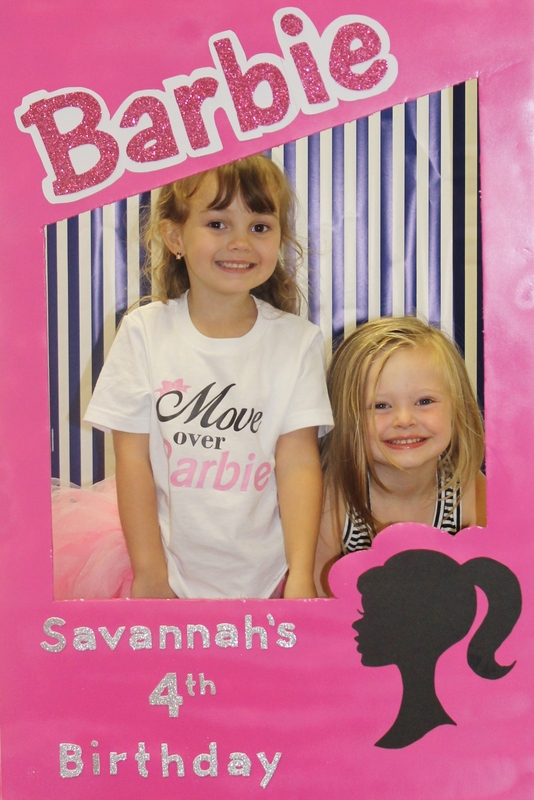 Unfortunately, with how crazy and hectic our lives have been the past few weeks I was not able to put as much time into Savannah’s party as I normally do. It breaks my heart….but in the end it all worked out and everything looked cute. Let’s start with the beautiful cake. 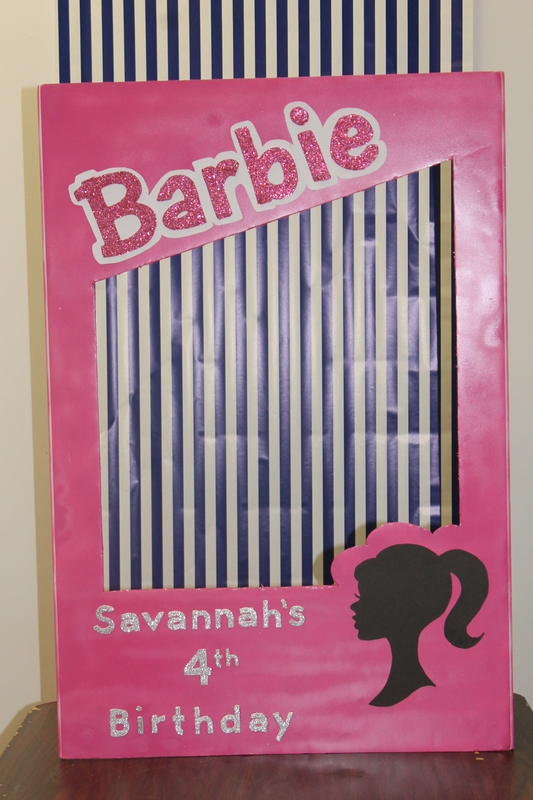 I absolutely LOVED this cake! 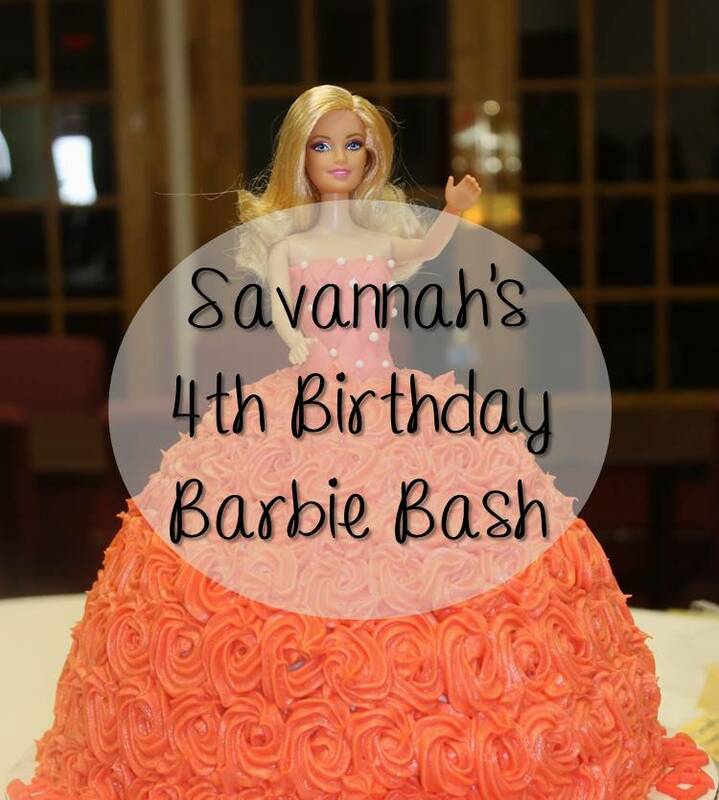 The only thing Savannah requested for her party was (and I quote), “I want a Barbie cake where we can eat her dress.” Ask and you shall receive. I was going to attempt to make this cake myself because you can buy the pan on Amazon. 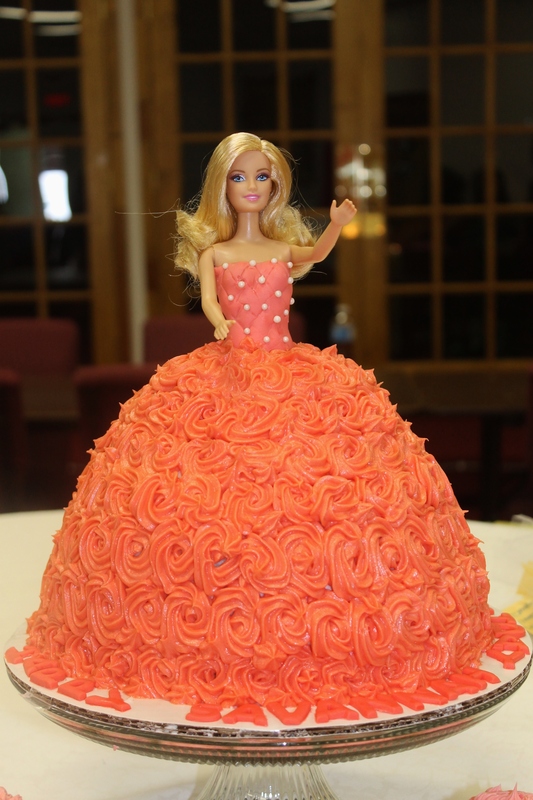 I quickly threw that idea out the window when I tried to improvise….I left the cake making to the professional. The lady behind this wonderful cake is Joy Frye from Lee County. She also made my husbands groomsman cake. She does an amazing job and is beyond reasonable on her prices. Everyone at the party loved this cake! 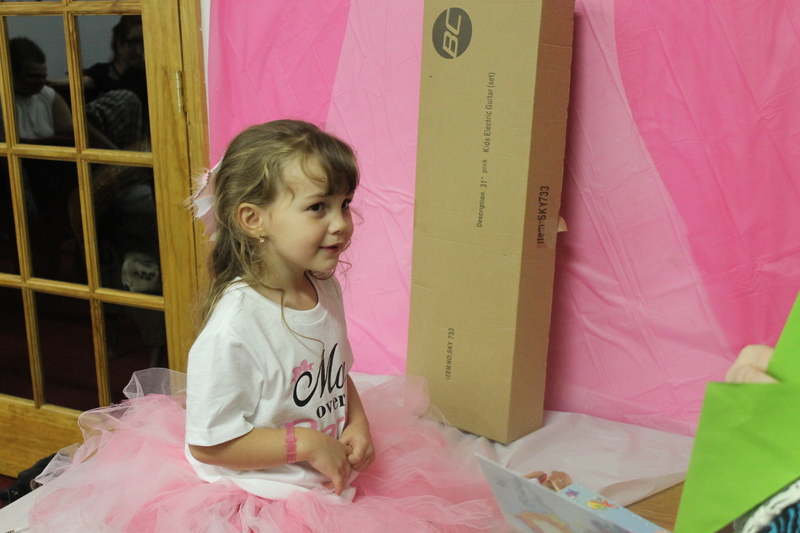 The birthday girl couldn’t get over how “pretty” it was :). And the best part?? It’s a whole Barbie in the cake AND Joy sent an outfit, shoes, and necklace for Barbie change into after she was done “modeling” the cake for us. Notice that adorable outfit on her? It was soooo cute! I had found something similar to this on Pinterest and just knew this baby had to have it! 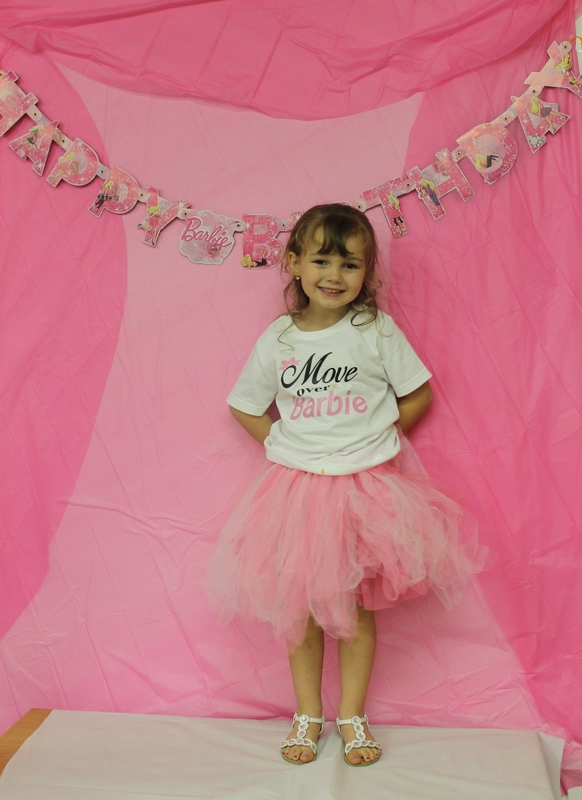 Thanks to Latoya from Bows by Toy for making this super cute outfit! 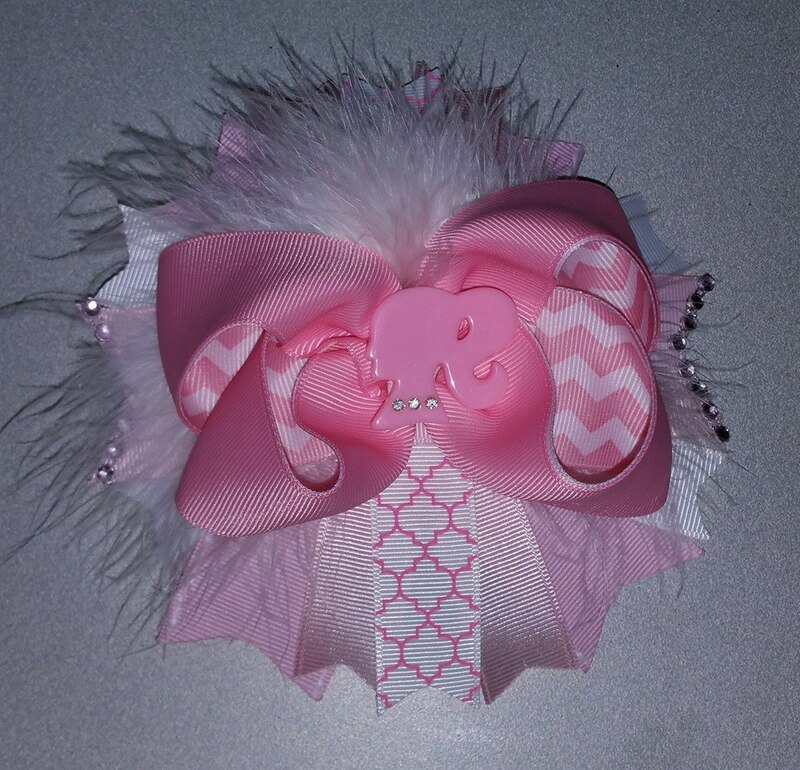 You can’t see the bow in this picture but below is a picture that Toy took of it. Such an ADORABLE outfit! Toy is also very reasonable on her prices! 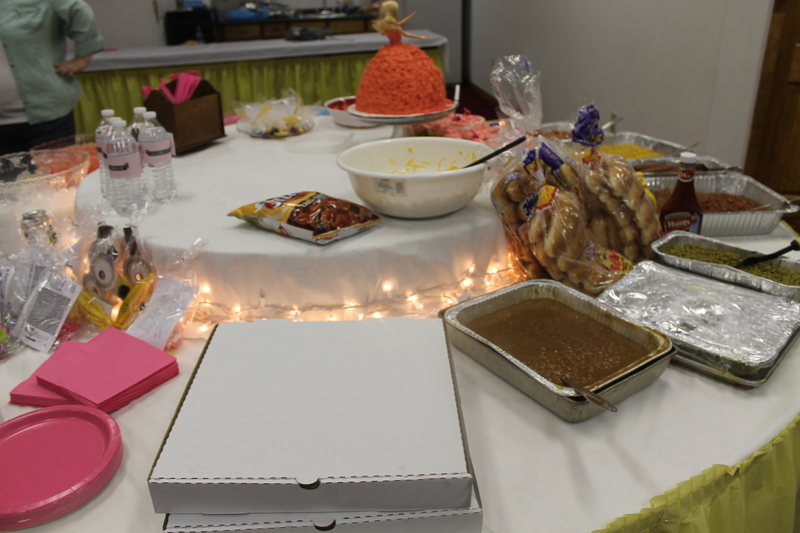 We had enough food to feed an army! 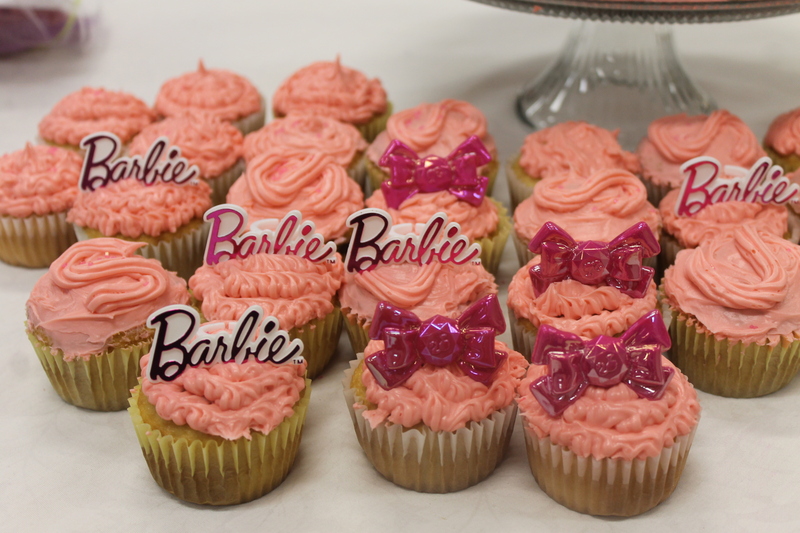 Of course the Barbie rings on top of them were a big hit with the girls :). 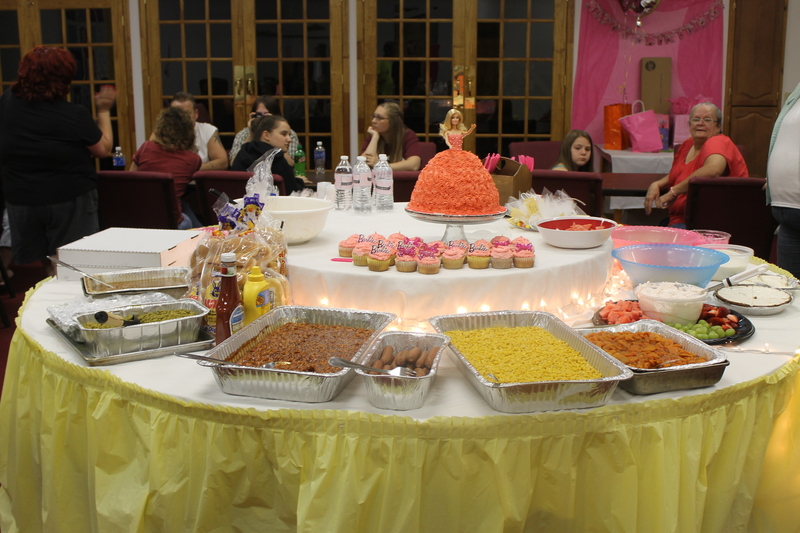 My mother-in-law cooked her heart out; BBQ chicken, peas, carrots, corn, baked beans, and hot dogs. 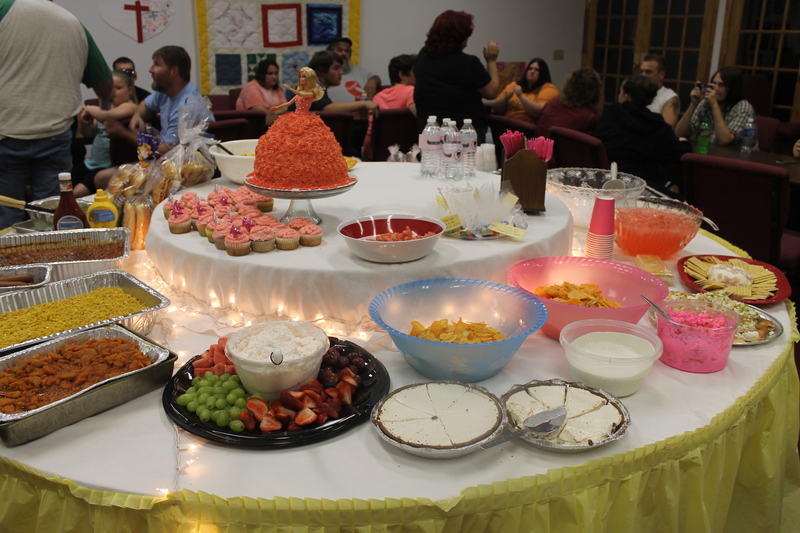 We also had: Corn Frito salad, fruit and fruit dip, pizza (for the kiddos), veggie pizza, cheeseball, peanut butter pie, chips and dip, and pink popcorn. 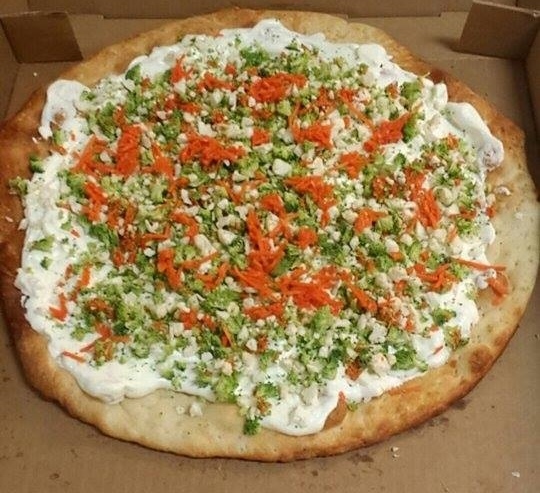 I attempted a veggie pizza for the first time and it turned out pretty good! 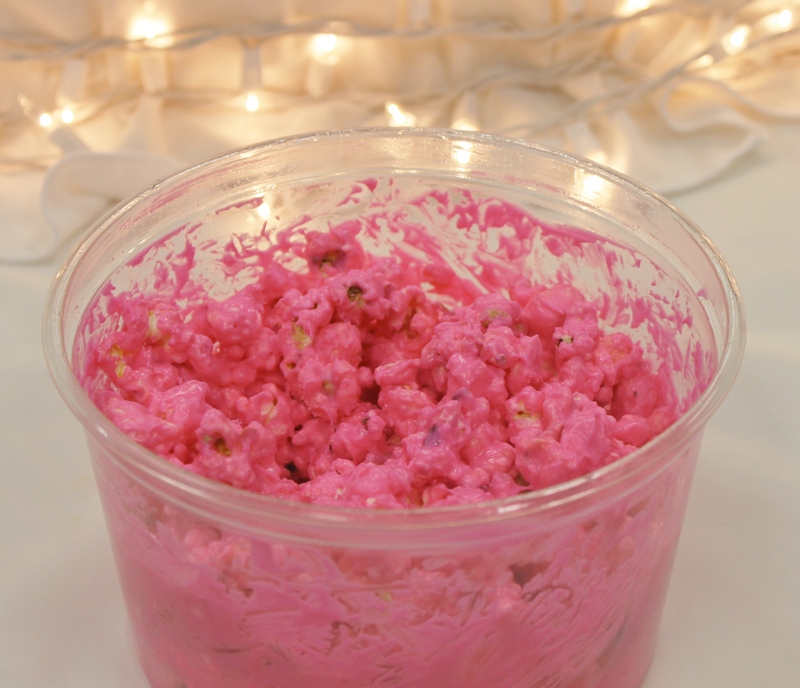 I also attempted a Pinterest inspired snack….Pink Popcorn. Surprisingly it was actually a hit at the party! 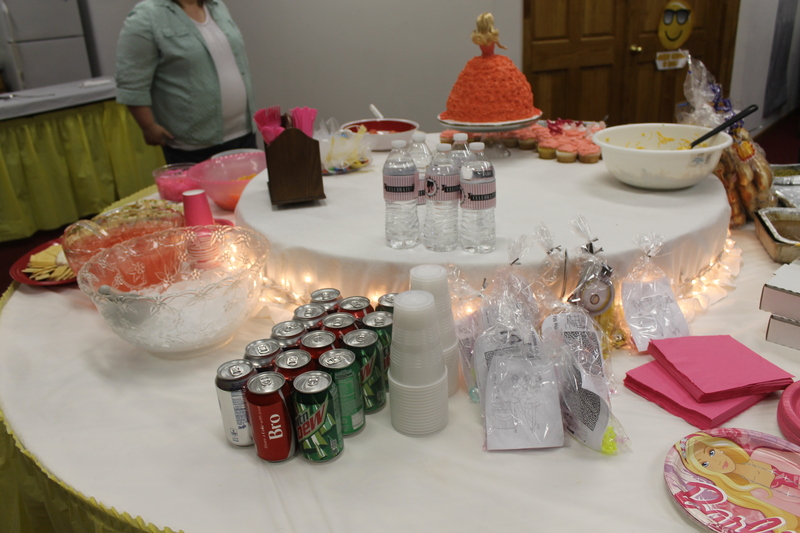 I mainly was making it for looks to add a pop of pink on the food table. 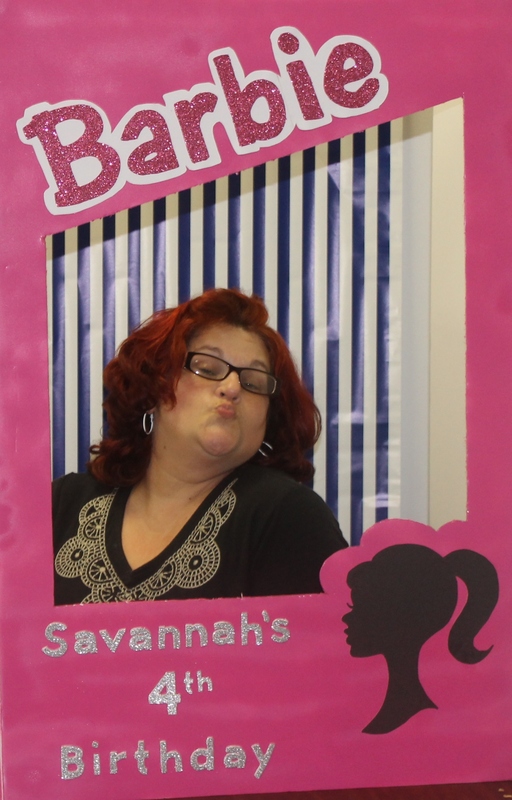 Photo booths are always fun at birthday parties. However, they can be very expensive if you rent them or even if you buy one with your theme. Luckily I have a very creative and crafty sister. This is so stinkin adorable!!! 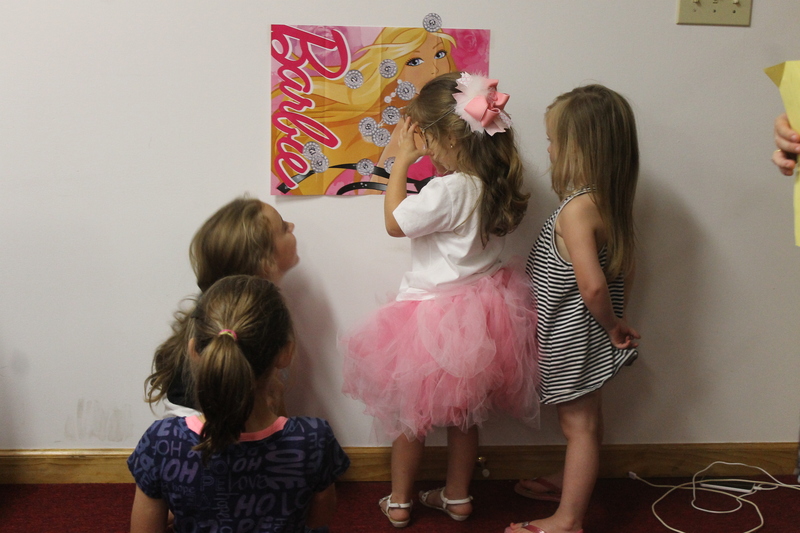 We played “Pin the Jewel on Barbie.” The birthday girl wanted to cheat haha. The kids loved this game! She was ready to open presents. 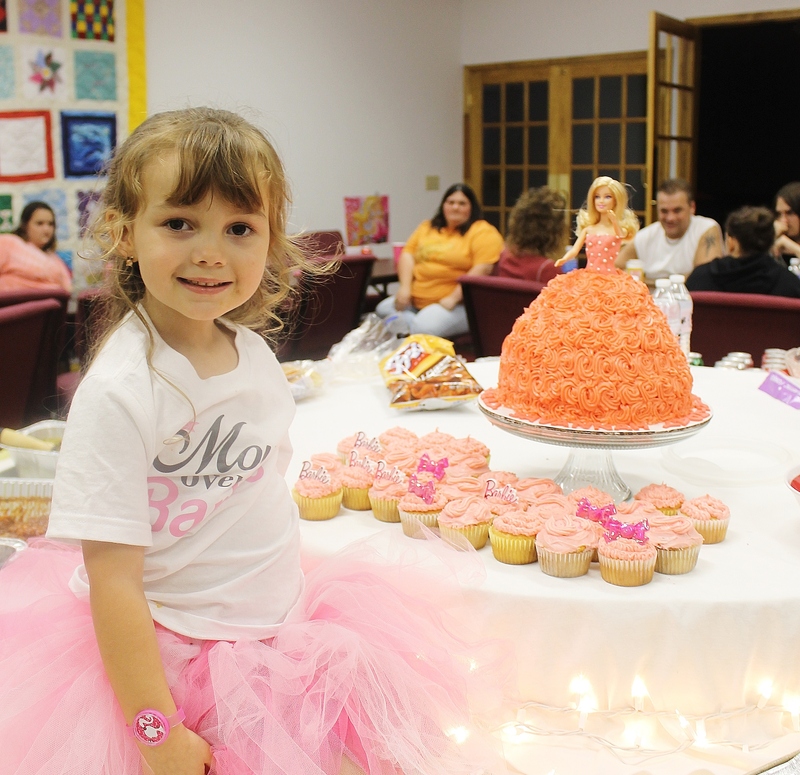 She’s holding the Barbie that was included with her cake. 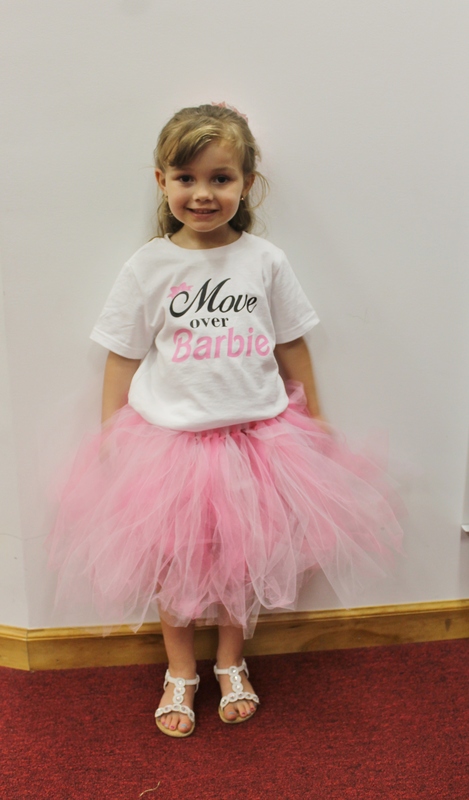 Thanks Joy for sending a stylish outfit for Barbie :). 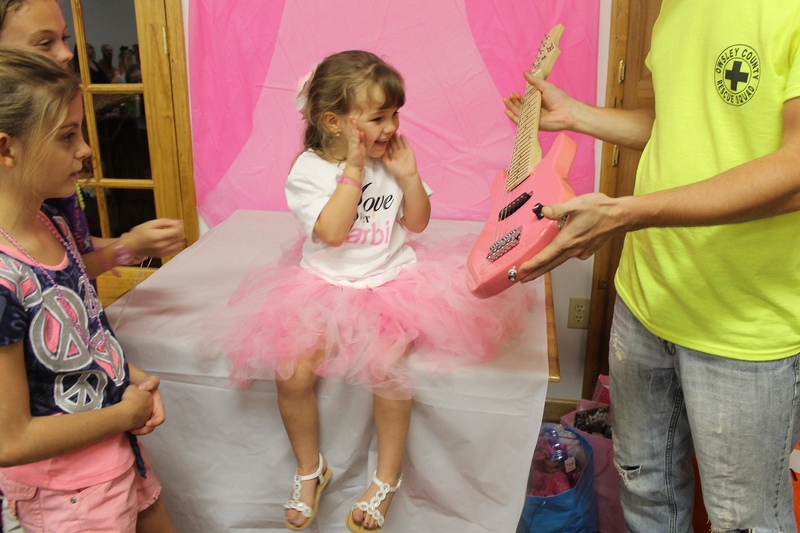 Waiting to see what it is……..
Daddy and Mommy Kirstie got her a pink electric guitar! 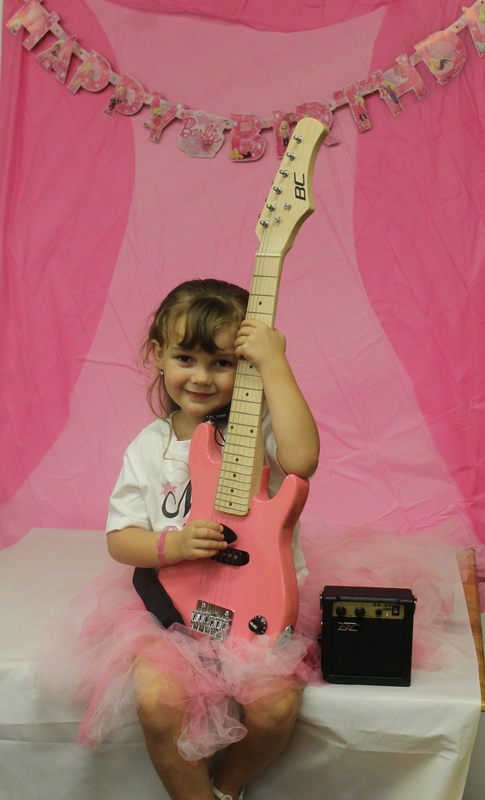 Believe it or not this was the ONLY thing this child asked for! She would NOT tell us anything else she wanted. So we got it! I love her face in this picture :). Does it get any cuter than this??? 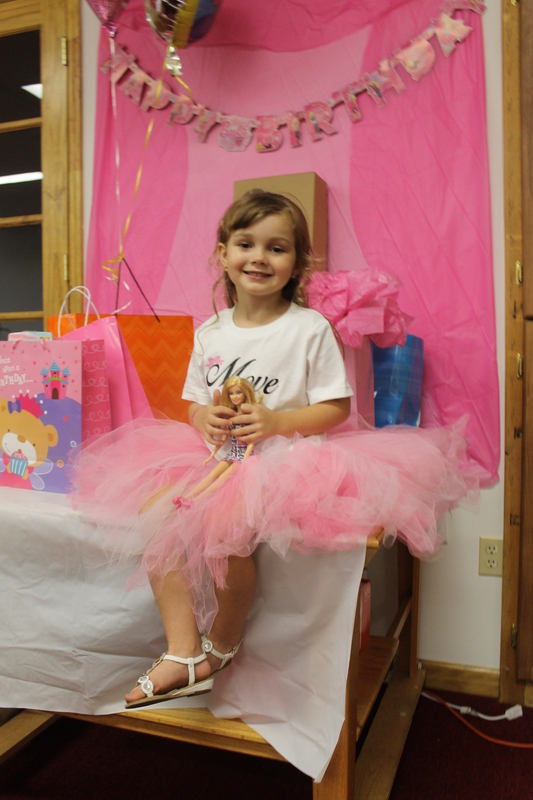 I am so happy this baby had a good birthday party. We are very thankful for all those who attended or sent cards/gifts. 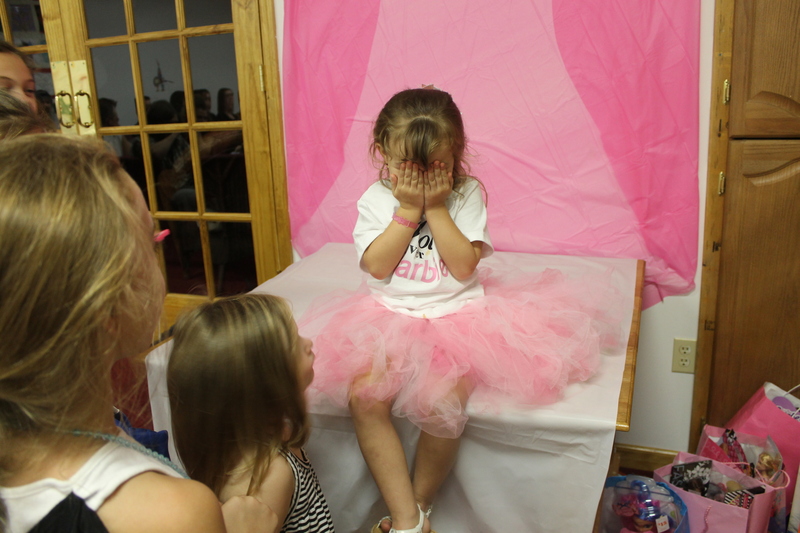 Birthday parties are so fun for me. I love planning events and being able to be creative. Most of all I love seeing my babies faces when their theme comes to life. That’s what it’s all about! As long as the kids are happy then we are happy :). 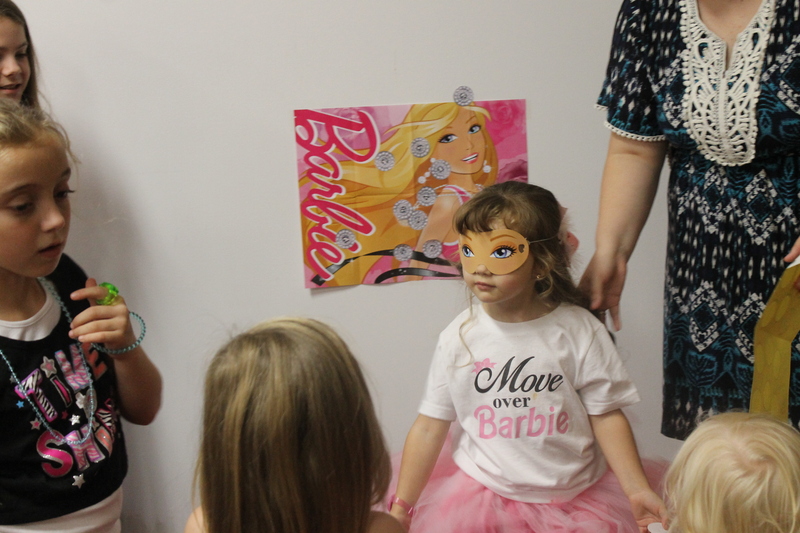 What kind of themes do you do for your kids parties? You are seriously an amazing person. Beautiful inside and out!!!! I hope I am half the mommy to my kids as you are ( I only plan on having 2 lol)!!!! Becky that means a lot to me! Way to go… you about made me cry lol. I try to be a good mommy :). You’ll be a wonderful mommy too… I know it!